This time last year I was busy planning and designing for the first ever literary festival in the London Borough of Barnet - or at least we were the first, last year. This year we have a couple of rivals, Middlesex University, where I once appeared having completed my MA in Writing, when it was held in Trent Park, Enfield. This year Middlsex Uni have changed the name to the North London Lit Fest and now it's in Hendon and takes place 26th and 27th March, 2-7pm each day. The line up is interesting and there are some great workshops such as the Speed Pitch - speed dating for writers. 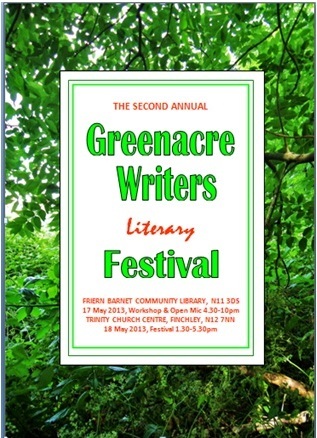 To find out more see: Middlesex Lit Fest Don't forget to come back so you can read all about the Greenacre Writers Festival! Another local group, Barnet Borough Arts also held a small event that started life as a literary festival but grew into a folk and poetry concert at the Old Bull Arts Centre in Barnet earlier this year. One of our coordinators, Allen Ashley, held a creative writing workshop for them. 'This year Finchley, next year Hay-on-Wye', that's what we said at the end of last year's festival. We didn't mean we wanted to perform at Hay-on-Wye (although as writers that would be nice) but to have a bigger festival. It's growing! This year the festival is running over two days, 17th and 18th May. And we have two venues: the liberated and saved Friern Barnet Community Library - The People's Library and Trinity Church Centre, North Finchley, where we'll be part of another growing arts festival, Trinity in May. Trinity Church are one of seven churches that provide shelter for the homeless during the winter months - and last year a couple of Greenacre Writers who were also 'Givers' for World Book Night held events there and gave away books to the people seeking shelter. This year I'll be back at Trinity in April, giving away copies of Jeanette Winterson's, Why Be Happy When You Could Be Normal? 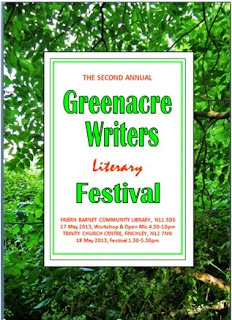 And then I'll be back there, 18th May, for the main Greenacre Writers Literary Festival. This year we have a small committee which means we can share the workload and it also means that more of our Greenacre Writer members are getting involved, getting committed to our literary view of the world. As Margaret Mead said, 'Never doubt that a small group of thoughtful, committed, citizens can change the world. Indeed, it is the only thing that ever has.' Well we may not have changed the world, yet, but we are changing the London Borough of Barnet. The world has shifted and great things have been happening in our borough over the last couple of years. The people, the community, have woken up, have risen up, and they are bringing literature to North London, liberating libraries and making good stuff happen.